A household is in fuel poverty if it is on a low income and faces high costs of keeping adequately warm and other basic energy services. Fuel poverty is driven by three main factors: household income, the current cost of energy and the energy efficiency of the home. Because of limited gas connectivity, households in many areas of Norfolk have above average electric and oil use (especially in rural areas), and so are disproportionately disadvantaged by the cost of heating their homes. Cold homes can affect or exacerbate a range of health problems. These include: including respiratory problems such as bronchitis and asthma, circulatory problems including strokes and an increased risk of anxiety, depression and other poor mental health issues. Estimates suggest that some 10% of excess winter deaths are directly attributable to fuel poverty and a fifth of excess winter deaths are attributable to the coldest 25% of these homes. Cold homes can also affect a wide range of issues linked to health, such as educational performance among children and young people, and increased absenteeism at work. Older people are particularly vulnerable to the impacts of cold homes. Cold temperatures increase the risk of strokes and circulatory problems, respiratory problems, hospital admissions, and lower strength and dexterity leading to an increase in falls and accidental injuries. 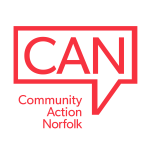 Community Action Norfolk is committed to tackling these issues and supports a range of initiatives across Norfolk. Delivery of training for households and frontline staff on improving energy efficiency, the importance of staying warm, renewable energy, switching suppliers. Member of the Affordable Warmth steering groups for south Norfolk. Promoting change at a strategic level and advising on a number of national, regional and local panels and forums. Supporting other funding providers such as Sheringham Shoal, Norfolk Community Foundation, Age UK in promoting funding to tackle fuel poverty. If you are concerned about fuel poverty, interested in developing community wide solutions or simply wish to know more please call us.